Ólafur Arnalds and Nils Frahm announce Double-CD release Collaborative Works – comprising all three vinyl EPs Loon, Stare and Life Story Love And Glory as well as 7 new songs from their Trance Frendz studio film. Stare (2012) was the very first collaborative recording made by Ólafur Arnalds and Nils Frahm – a true family effort featuring long-time collaborator and cellist Anne Müller, which took place in 2011 between Reykjavík and Berlin. Originally released as a strictly limited 10-inch vinyl record exclusive on Record Store Day 2012, this long sold-out must-have was re-issued on July 17, 2015 – this time in 12-inch format. Óli and Nils recorded and mixed their first collaborative record between Reykjavík and Berlin as a surprise release for label founder Robert Raths. Loon (2015) is a synthesiser-led 5-track EP that was recorded in autumn 2014 across five days at Nils’s Durton Studio in Berlin, and continues with the ambient sounds of Stare but with the addition of more percussive elements and dub influences. For Loon they wired the Oberheim 4 Voice and a Korg PS3100 to the patch bay/mixing desk and performed live takes. With all four hands on its pots, all mixes were recorded straight onto 2-track ½-inch tape. 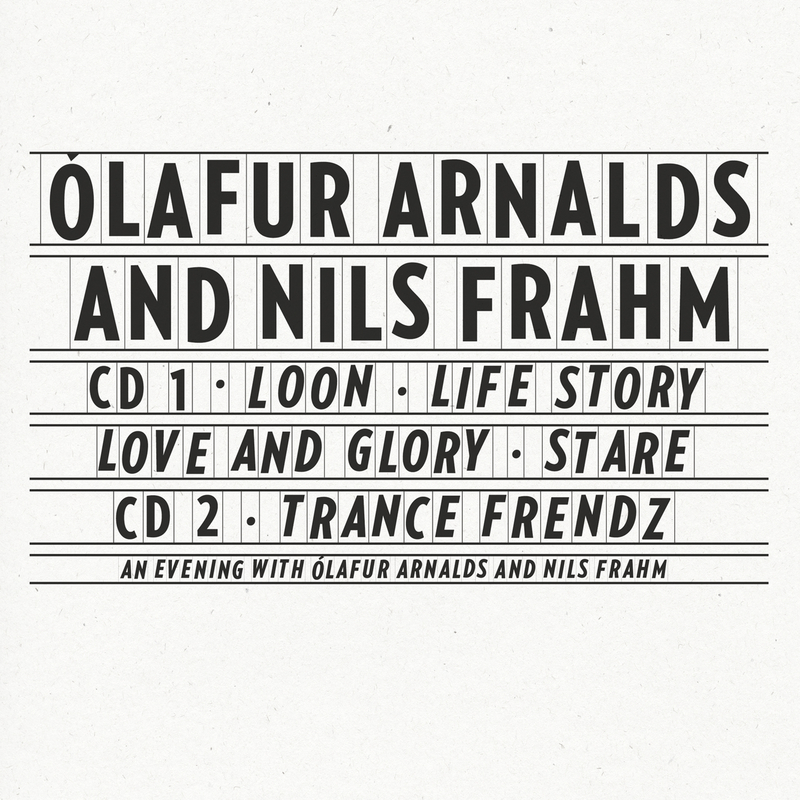 Life Story Love And Glory (2015) is a 2-track live improv affair on two pianos, also recorded at Nils’s place in October 2012, the day before the two went on the road for the Erased Tapes 5th Anniversary Tour. It was released on August 21, 2015 as a surprise 7” available through record stores only, two weeks ahead of its digital release, and entered the Official UK Vinyl Single Charts at #3, still remaining in the Top 10 after three weeks. Trance Frendz (2015) is the audio recording of their intimate 45-minute studio film. Originally planned as a short video session of previously released tracks, instead the two ended up recording seven brand new improvisations – showcasing the nature of their musical friendship. It was revealed on September 1, 2015 as part of their joint website www.arnaldsfrahm.com. "The music on this CD is a collection of our studio collaborations from recent years. We would meet in Reykjavik or Berlin with the intention to share some days off work, hiking, swimming or eating pizza. That is great for a couple days, but after a while we would always end up back in the studio, fiddling with synths or pianos. This collection of recordings cannot be an album. It will remain a collage of our studio experiments of the past. It simply is convenient to have them all together here, so you don’t need to look out for some limited 10” somewhere or deal with a nerdy record dealer in Japan to track down this one 7 ̋ which will turn out to sound pretty rough anyways... consider them as moments in space and time where we shared the same room for some days to come down and enjoy making music. After deciding to release the studio collaborations, we planned to do a video session of us performing an improvised duet to promote the release. On the 28th of July 2015 we met up at Durton Studio in Berlin and invited Alexander Schneider and his camera to document it.